The Oxford Down sheep produce a lot of wool, as you would guess by their looks. Because their wool does not thicken easily, it is possible to shear them only once a year, yielding heaps of very long-stapled wool. For the well-being of the sheep, however, it is recommended that they not be sheared more often than every 6-8 months. At our farm, the sheep are sheared twice a year: after the pasture season in autumn, and during the lambing season in spring. If we do not want to use a lamb for producing a long wool lambskin, it will be sheared at the age of 4-5 months. We shear the mature sheep ourselves, but professionals shear the lambs. They use the so-called New Zealand style, where the lamb is set in front of the shearer and rolled around during shearing until all the wool is gone. The Oxford Down’s wool is fine, dense, and elastic and the wool staples are even in width. These properties make the wool great for using it as stuffing. If you are looking for a Finnish product for filling saddles or toys, for example, you could choose our washed and teased wool stuffing. The stuffing can be hand washed by gently squeezing. The carpet industry, too, prefers using this long-stapled material which does not felt easily. Wool is excellent for hand spinning as well, because its slightly coarse fiber holds together well and it is easy to handle. As you can see, Oxford Down has several valuable wool properties, although the breed has actually been bred for meat production. 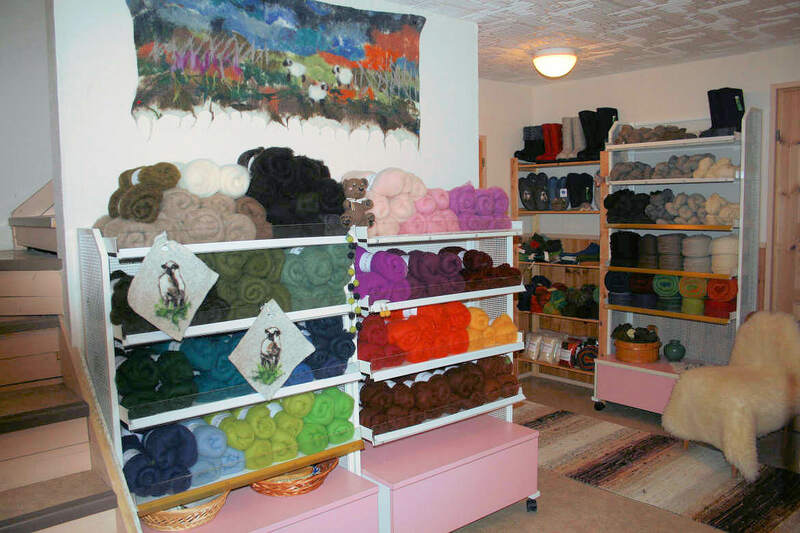 We deliver our cleaned wool to the spinning mill Pirtin Kehräämö, located in Hiirola, and they produce threads, felting wool, and tuft yarn, which we sell at our shop. We also retail felt boots and slippers produced in the felt boot factory Lahtiset, as well as products made by local craftsmen. Our wool products can be purchased in our shop at the farm, but you can use the contact form to make inquiries about them.